Christopher Innvar (left) is Kurt and Cassie Beck is Alice in August Strindberg’s The Dance of Death. Top: Innvar and Beck with Richard Topol as Edgar, the captain. Edgar is the commandant of a remote artillery fortress, and the couple live in penury, constantly squabbling and insulting each other. Alice’s temper has just led her to dismiss their maid. The captain, meanwhile, has alienated everyone on the base—“I refuse to mix with that scum”—so that they have no friends. Captain: Well of course I do. Don’t you? Alice: I thought we might show more decorum by keeping our long miserable mistake to ourselves. McPherson has made tweaks to the dialogue that have enhanced payoffs, as in a passage about wine. Captain: Have we any of that zinfandel left, chilling away down there in the wine cellar? Alice: We don’t have a wine cellar. Captain: What happened to our wine cellar? Alice: You mean the laundry room? Strindberg’s original has no mention of a laundry room—only that the wine cellar hasn’t existed for five years. McPherson’s interpolation is not only faithful to the non-existence of the wine cellar, it adds a comic twist. Captain: You know, I was going to suggest… that perhaps, some evening, we might eh… well, invite a female companion up for a… for an evening. You know. Alice: I’d prefer we invited a male friend. Beck and Topol play a couple locked in a toxic marriage in Strindberg’s classic. Photographs by Joan Marcus. As the unhappy couple, Richard Topol and Cassie Beck are terrific. They find the nuances in the advances and retreats of their constant battle. Topol’s captain is overbearing and smug, but declining physically. As for Alice, Strindberg’s misogyny is on display, as Beck’s chilly spouse hopes for her husband’s demise. 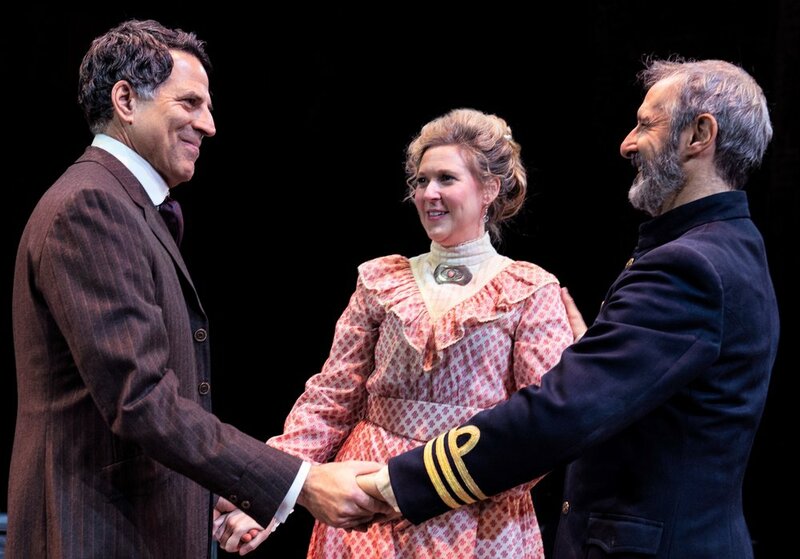 By turns Topol and Beck bring out the nihilism in the dialogue, the grim, life-or-death struggle of their marriage. They are well-matched monsters. Their battle takes a serious turn when Kurt (Christopher Innvar), the doctor who introduced them and who has just been assigned to the garrison, arrives. The concerned and sympathetic Kurt is drawn into their web until Edgar manages to have his son transferred to the fort. Since Kurt is forbidden by the courts ever to see his children, Edgar’s callousness in bringing the boy so close infuriates him. Meanwhile, Alice once had a fling with Kurt, and she hopes to persuade him to take her away. Strindberg’s expressionism is also on display in the production, in moments of hallucinatory horror (helped by effective lighting from Stacey Derosier, original music by Jeff Blumenkrantz, and sound by Quentin Chiappetta), as the disoriented Edgar succumbs to trances and staggers around the stage. The captain holds out hope for an end to this toxic marriage: “If we can be patient,” he says, “death will come, and then, perhaps, life begins.” But the grim truth is that “the dance of death” is just another term for life itself. The August Strindberg repertory productions of The Dance of Death and Mies Julie play through March 10 at Classic Stage Company (136 E. 13th St., between Third and Fourth Avenue). Performances are Wednesday through Sunday. For the repertory schedule, visit classicstage.org.